Tourism Malaysia remains positive that the tourism landscape in the country will continue to be blessed with many success stories in the future. Nevertheless, we are also fully aware that the industry will face many challenges and obstacles along the way, as we strive to achieve the Government's target of 36 million tourist arrivals and Rm168 billion in tourist receipts by the year 2020.The promotional strategies and programmes for 2018-2020 are geared towards achieving the Government’s goal, hence we will work closely together with local and international partners and stakeholders to ensure the success of all our plans. In addition, we have also designated 2020 as Visit Malaysia Year to further promote Malaysia’s extensive tourism offerings and boost our tourist arrivals and receipts. Generally, Tourism Malaysia will focus on its participation in major international trade shows and leverage on accessibility and connectivity, as well as place higher emphasis on digital marketing and optimise the use of the latest information technology in the promotion of the country’s tourism. In conclusion, this plan is prepared as a guide for users in planning and implementing tourism promotion activities and efforts for 2018-2020. There is still much room for these guiding principles to be applied according to the creativity and innovation of the user, as well as the suitability and needs at a specific time, place, and situation. Tourism Malaysia is confident that the country’s tourism industry has great potential for growth in the coming years, with many new infrastructures, attractions, and policies and incentives being formulated and implemented. We believe that Malaysia’s tourism industry will continue to flourish as one of the nation’s vital supporting economic pillars. 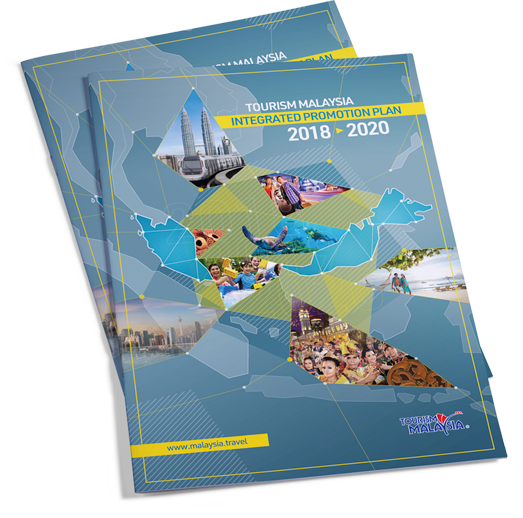 To learn more about Tourism Malaysia Integrated Promotion Plan 2018-2020, click at the button below to download the full version.